The Connecticut Fire Marshals Association unites for the mutual benefit and professionalism of all certified Fire Marshals, their Deputies and Inspectors of the State of Connecticut and all other persons engaged in the prevention of fire and protection of life and property. The Association acts as a central resource for exchange of professional knowledge among its members for the purpose of assisting one another in the performance of their duties, in the conduct of their professional activities and to correlate these activities in their efforts to reduce fire loss while promoting education and training, research, legislation and regulations for improving fire safety and prevention. 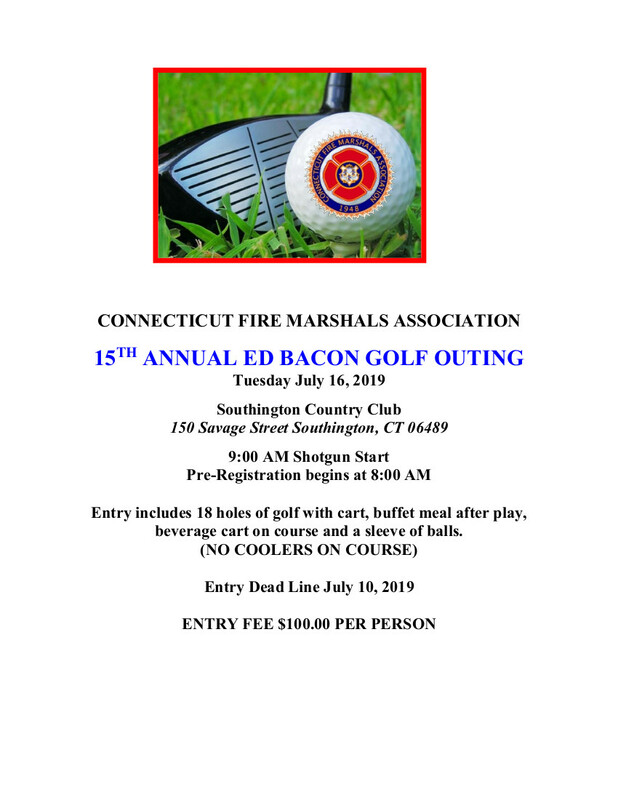 The 2019 15th Annual Connecticut Fire Marshals Association Ed Bacon Golf Outing will be held July 16, 2019 at the Southington Country Club. All are welcome to play. Join us for a great day of networking. Click here for registration and sponsorship opportubities. Thank you for attending the Connecticut Fire Marshals Association Annual Meeting & Conference on April 11-12, 2019 In Berlin CT at Eversource. If you need a certificate of attendance please contact Peter Wilse. Click Here for Brochure and Registration Information. The 2018 Connecticut Fire Marshals Association membership dues notice is out. Please download and complete the information on the dues notice and submit with payment, or payment may be made via PayPal.